Modular Ballistic Podium | Defenshield, Inc.
Modular Armor Podium System designed for rapid assembly/disassembly. Defenshield’s Modular Podium brings a new level of ballistic protection to applications ranging from courtrooms to airports to boardrooms. 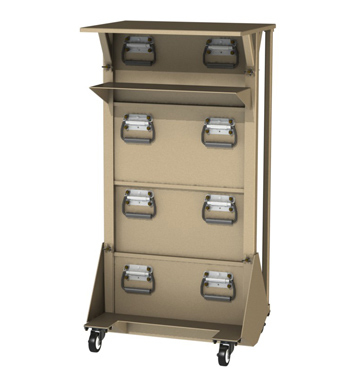 The unit is available with integrated upper and lower shelves and casters for maximum mobility. Modular, user-replaceable armor with protection levels up to NIJ Level IV makes the unit a simple yet powerful way to protect speakers, security officers, employees or other personnel from ballistic threats. It can be broken down in minutes for easy transport. 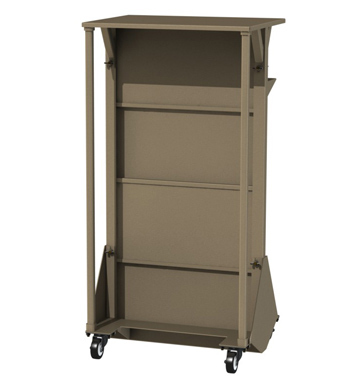 The Modular Podium is currently in use by the U.S. Department of State and other diplomatic security agencies at multiple locations.